(CNN) -- The U.S. Consumer Product Safety Commission is asking parents to immediately stop using a series of inflatable floats for babies in swimming pools, announcing a voluntary recall of about 4 million floats Thursday. The Squirtin' Tootin' Tugboat is among the floats covered by the recall. The items -- which inflate to seat babies and toddlers as they float on water -- are manufactured by Massachusetts-based Aqua Leisure Industries. 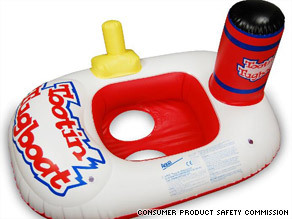 The company has voluntarily recalled 14 models because the leg straps in the seat of the float can tear, causing children to slip into the water, posing a drowning risk, the commission said in a statement. There have been 31 reports of float seats tearing, though no injuries have been reported, the commission said. The floats were sold from December 2002 through June 2009 at retailers nationwide, including Target, Toys "R" Us, Wal-Mart, Dollar General, Kmart, Walgreens, Ace Hardware and Bed, Bath & Beyond. The commission is asking consumers to stop using the floats and to send them back to the company. Aqua Leisure officials could not be immediately reached for comment, but the company's Web site has posted the commission's recall advisory. CNN's Gerri Willis contributed to this report.